Ten. Count them. Ten. There are ten new cooking-related books on my bookshelf this month. That’s one for every other day of 2014 so far. This cannot continue. There’s nothing growing in the allotment (apart from the last of the beetroot, what else, which I harvested this weekend, but I won’t bore you with yet more beetroot recipes. See here, here and here if you’re in need). The beds are dug and snug in their black fleece blankets in an attempt to quash the weeds. Clearly, there’s only one thing for it. Buy cookbooks. And so, my glut for this week is new cookbooks. 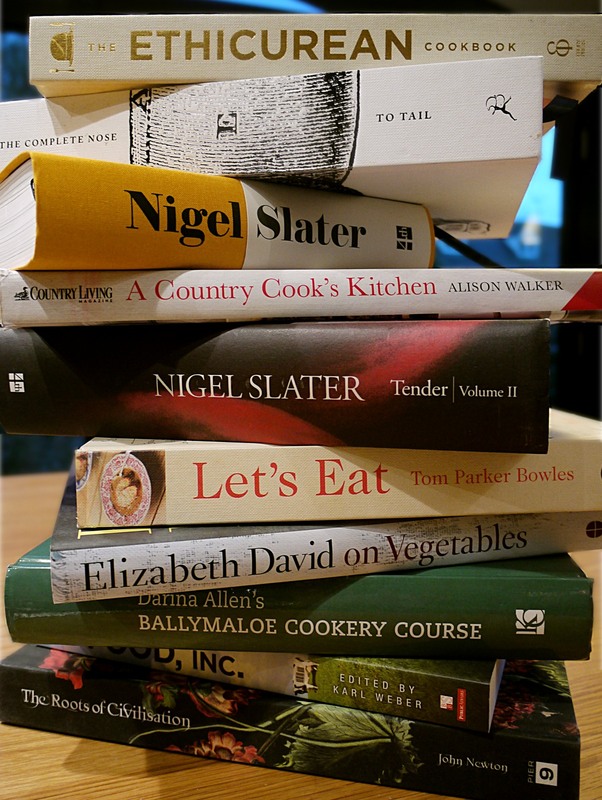 I will endeavour, this may be folly, we shall see, to cook something from each book every day for the next 10 days. 1 book per day. Or thereabouts. Good luck! A glut of cookbooks is always a good thing in my view. I cook lots from the Ballymaloe book and am always leafing through Nigel Slater’s Tender Part 1 for inspiration – he’s great for garden gluts isn’t he. Very interested to hear what Tender Part 2 is like and also the Ethicurean book. Both are on my wishlist. Thanks for the good luck. I think the Tender 2 was in the sale because it didn’t come with volume 1. Interesting to hear that it’s a goodun too. Thanks, as always, for getting in touch. Now that’s the kind of glut I’d like to have! You can’t really have too many cookbooks – just too little space on the bookcase. After your recommendation I’ve ordered Let’s Eat from the local library and am looking forward to reading it – thanks! me too! I just like ready the cookbooks… and looking the pretty pictures of course.